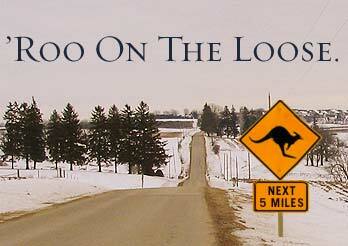 Lands' End Newsletters | 'Roo On The Loose. A doctor friend of ours, when she's given to philosophizing about the art of diagnosis, has a favorite saying: "If what you see are hoof prints, don't go looking for zebras." That's her homespun version of the thing philosophers call Occam's Razor: that the simplest explanation ought to prevail. But real life doesn't always hew to the wisdom of philosophers. 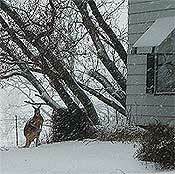 As we in Dodgeville discovered when a footloose kangaroo turned up in our midst. Now, kangaroo sightings are to Wisconsin what sightings of Bigfoot are to the Pacific Northwest: more likely to be reported than confirmed. Back in the 1970s, there was a spate of sightings around the Milwaukee suburb of Wauwatosa. And another rash a few years earlier in Menomonee Falls. And so, on the morning of January 5, when a longtime resident called into our local sheriff's office to report a kangaroo at loose on her property, Sheriff Steve Michek had the predictable reaction: "There's gotta be a simple explanation." The day of the sighting, a snowfall expected to reach seven-to-nine inches had begun descending over Dodgeville. Sheriff Steve got his first glimpse of the creature through a swirl of dancing snowflakes. There he stood - big as life - with a fluffy cap of the white stuff improbably dusting his head and back. Sheriff Steve says his own reaction could be summed up in two words: "Holy smoke!" Except, he says with embarrassment, he didn't say "smoke." Once backup arrived, Steve and the deputies sprang into action. Sheriff Steve: "We formed a perimeter." With a little bit of coaxing (and a bribe of apples), the renegade was lured into a barn on the property and quietly settled down in a tidy box stall. Officials from the Henry Vilas Zoo in nearby Madison were contacted and the fugitive taken into custody. The zoo folks have since speculated that our unlikely visitor is most likely somebody's rogue exotic pet. That would, after all, be the simple explanation. Which brings us 'round to the moral of our story: next time you discover some curious critter tracks outside your garden window - don't rule out the zebras. The sunny days of spring needn't signal an end to sweater weather. Lands' End has a range of sweaters in silk/cashmere, fine gauge cotton and our classic cotton Drifter™ - soft, breathable classics sure to add plenty of sweater days to anybody's calendar. See all Lands' End Sweaters for WOMEN and MEN. Win a spot on the crew of a sailboat competing in the Chicago Yacht Club's Race to Mackinac. Click for details. Look at the latest for Women, Men, Girls, Boys and Home. Top-notch details, miniscule price.3/4-SLEEVE DROP-NEEDLE TEE - from $12. Find more "new favorites" in our WOMEN'S STORE. Supima® - the cotton supreme. 1X-3X SHORT SLEEVE SUPIMA V-NECK TEE - $19. Find more inspirations in our WOMEN'S PLUS SIZE COLLECTION STORE. Meet our wrinkle-resistant, anti-pilling, fade-fighting Mesh Polo. SHORT SLEEVE TRIM FIT BANDED MESH POLO - $19.50. Find more great "guy stuff" in our MEN'S STORE. Triple major in wearability, washability and durability. KIDS' COLLEGE STRIPE MESH POLO - $16.50. More for kids of all kinds in our BOYS' STORE and GIRLS' STORE. The unmatchable thirstiness of Turkish terry. 6-PC. COMBED COTTON TOWEL SET - $33. Find everything to make your house a home in our HOME STORE. Find bargains galore in our WOMEN'S OVERSTOCKS STORE. Find bargains galore in our WOMEN'S PLUS SIZE COLLECTION OVERSTOCKS STORE. Find bargains galore in our MEN'S OVERSTOCKS STORE. Find bargains galore in our BOYS' OVERSTOCKS STORE and GIRLS' OVERSTOCKS STORE. Find bargains galore in our HOME OVERSTOCKS STORE.